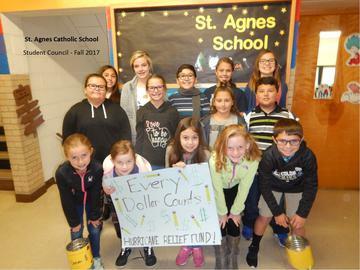 St. Agnes offers opportunity for enrichment and development of leadership skills through extended learning opportunities for our students. As 5th graders, students have the opportunity to participate in band courtesy of the public school music program. Students and parents are invited to an instrument showing at the end of the 4th grade year. Instruments may be purchased or rented from the local music store. Lessons occur once a week on Thursday mornings at Bluffs Middle School. St. Agnes participants walk across the street for this 30-minute lesson time. As 5th graders, students have the opportunity to participate in orchestra courtesy of the public school music program. Instruments may be purchased or rented from the local music store. Lessons occur once a week on Thursday mornings at Bluffs Middle School. St. Agnes participants walk across the street for this 30-minute lesson time. This select show choir is open to students in 4th and 5th grade who are chosen after a tryout. Students meet on Friday mornings for 30 minutes and one night a week after school. The group performs at the Old West Choir Fest, local nursing homes and other events per request. Students must be in good academic standing for participation. This opportunity is open to 3rd-5th grade students who are in good academic and disciplinary standing. As ambassadors for our school, these students will work to promote community amongst our students and families, will provide service to the school, church and community and will strive to better develop their personal leadership skills. Students in Pre-K-5th grade participate in our reading incentive program established to promote reading outside the classroom. Goals are set for the various grade levels and when met, small incentives may be earned. If semester goals are achieved, students are invited to participate in a large group party as reward for their efforts. All students are highly encouraged to participate in this program for the betterment of their reading and overall academic progress.